After attending the Dirt Candy book release party our friend Melissa joined us for dinner at Tasty Hand Pulled Noodles in Chinatown. (As I mentioned, we didn’t get much to eat at the party.) On the way over we kept going back and forth between going there or to Great New York Noodletown, and by the time we arrived at the restaurant I was really craving some noodles. I was glad to see that they offered a vegetarian broth along with their tofu noodle soup, which came with the tofu on the side. I didn’t learn until afterwards that you can order your hand-pulled noodles in different thicknesses, but the default ones were awfully good — silky smooth with just a hint of chewiness. The broth was a bit mild, but some chile oil and cilantro brightened it right up. 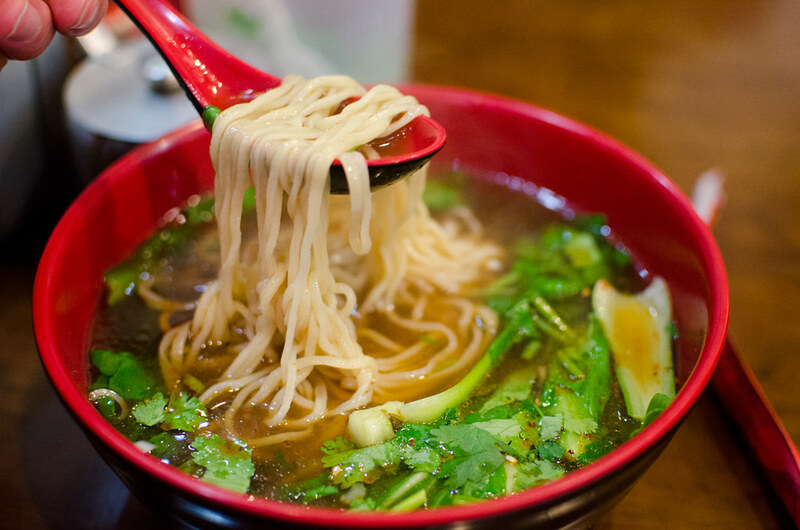 I’d love to go back for some of the pan-friend noodles, and I’ll definitely go for some thicker ones next time.